Apple’s iPhone XS and iPhone XS Max come with the A12 Bionic chip, which as the Cupertino-based tech giant obsessively repeated during the September 12 event, is the most advanced processor it ever built. And while it makes sense for the latest iPhone to come with the best chip, a Geekbench comparison between the iPhone XS and the iPhone 8 Plus shows there’s still room for improvements. While in single-core performance it’s pretty clear that the iPhone XS is the better model, with a score of 4813 versus 4307, not the same thing can be said about multi-core performance tests, where the older model managed to beat the latest-generation iPhone. 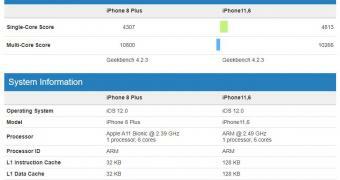 iPhone XS achieved a score of 10255 in these tests, while iPhone 8 Plus, which runs on the old A11 Bionic chip, reached 10800. Previous story Is the iPhone XS Too Expensive or Not?